A Tom & Jerry is a classic winter cocktail and a beverage that every explorer of the drink world should try at some point. 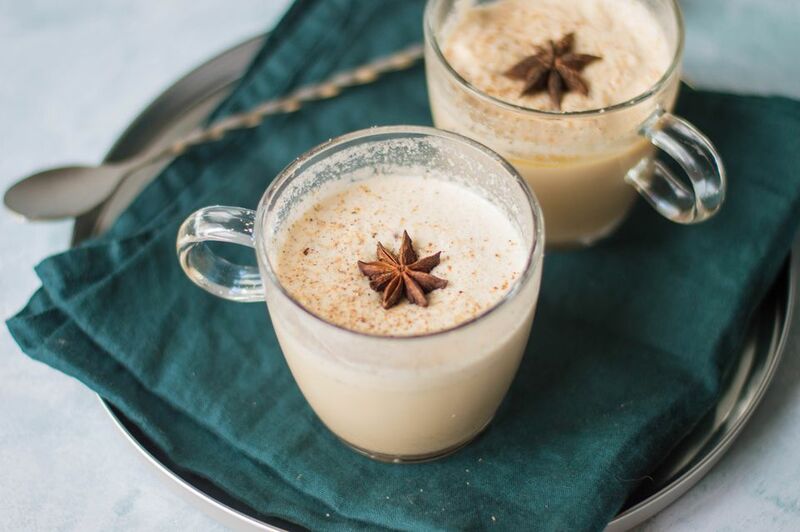 It's a sweet, frothy, warm drink that is flavored with dark rum and cognac and it has been a holiday favorite since the 1820s. There's no sugar-coating it: the Tom & Jerry is not the easiest drink to make, but it is worth it. While this drink is often compared to Eggnog, it is a completely different drink. The main difference is that the Tom & Jerry is served warm and the drink is built in the serving mug. Eggnog, on the other hand, is cold and already mixed and ready to drink. The Tom & Jerry is, however, a fantastic alternative to Eggnog and many drinkers prefer it because it is more of a warm milk punch and has less of an 'eggy' flavor. You will find that the Tom & Jerry is much like making a Hot Buttered Rum. It all begins with mixing the spiced batter, which can be refrigerated or frozen until it's time for a drink. At that point, it's as simple as pouring warm milk over your liquor and batter. It's a fabulous way to have a tasty hot cocktail at the ready for holiday visitors and parties. Note: while there are multiple steps to this recipe, this classic Tom and Jerry cocktail is broken down into workable categories to help you better plan for preparation. Separate the egg white from the egg yolk and place each into individual bowls. Add the cream of tartar to the egg whites and whip with a mixer until you have a meringue-like texture with stiff peaks. Add the softened butter and sugar to the bowl of egg yolks and whip until it is fully incorporated and a liquid. Gently fold the egg yolk mixture into the egg whites. Stir in the cinnamon, cloves, nutmeg, vanilla, and rum. Cover and store the batter in the refrigerator until it's time to make the drink. Pre-heat the mugs you will use for serving the Tom & Jerry. Add 1 heaping tablespoon of the batter and 1 ounce each dark rum and brandy to each mug. Fill with hot milk or water (or a combination of the two), stirring constantly until the drink is foamy. Some recipes skip the spices and vanilla in the batter. In this case, consider garnishing with a mix of ground cloves, cinnamon, and nutmeg to spice up the drink. A few of the older recipes use a considerable amount of sugar and skip the butter. This is used most often when mixing the drink with hot water to give it more froth and cream. Others are written without the pre-made batter. Whipping egg whites is not an easy task, though, so it's best to do this in bulk rather than with just an egg or two. Feel free to adapt this recipe to your own taste.